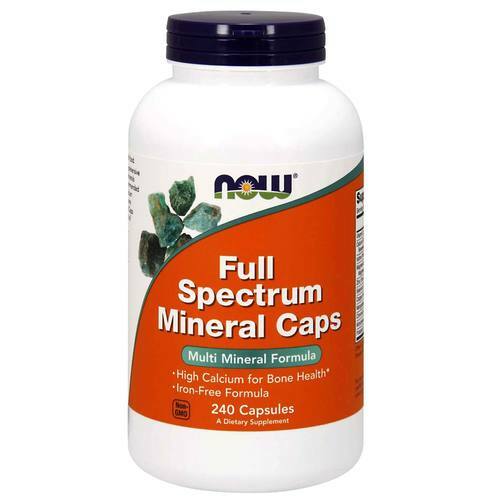 Now Foods Full Spectrum Mineral Caps is a comprehensive combination of important dietary minerals in an iron-free formula for easy consumption. Notes: Not manufactured with wheat, gluten, soy, milk, egg, fish or shellfish ingredients. Produced in a GMP facility that processes other ingredients containing these allergens. Natural color variation may occur in this product. Recommended Use: Take 2 capsules daily with food. The customer reviews posted below are based on individual consumer experiences and may NOT necessarily represent what expected results will be from using or taking Now Foods Full Spectrum Minerals Caps - 240 Caps. These results may not be typical and you should not necessarily expect to receive the same results. Actual results may vary. Very complete vitamin supplement for the well-being, mainly for practitioners of physical activity. Excellent product! It has in its formula all the major minerals necessary for the proper functioning of the human organism. After a few days of use I realized some benefits such as layout and more energy. Hair and nails look healthier. The bottle has 240 capsules, so it will last a long time! Now products are great, all reliable. Highly recommend and give it 5 stars. Minerals to take effect have to be chelated, and this is, great product!